Border Patrol agents assigned to the Interstate 35 immigration checkpoint observed a tractor-trailer rig approaching for inspection. During an interview, the agents learned the driver is a Mexican national who is legally in the U.S., according to Laredo Sector Border Patrol officials. The agents conducted an inspection of the rig using non-intrusive imaging technology and discovered an anomaly in the Windjammer above the truck’s cabin. An agent looked into the area and discovered two people hiding. The agent got the individuals down from the hiding space and learned they were Mexican nationals who are illegally present in the U.S. The agent arrested the driver for alleged human smuggling violations and then arrested the two illegal immigrants. They will be processed according to Laredo Sector guidelines. On Monday, checkpoint agents also found three migrants allegedly being smuggled by a woman in a Mitsubishi Outlander SUV, Laredo Sector officials stated. The three migrants were from Mexico and were also illegally present in the U.S. The agents seized the vehicle and arrested the woman for suspected human smuggling violations. The migrants will be processed according to Laredo Sector guidelines. 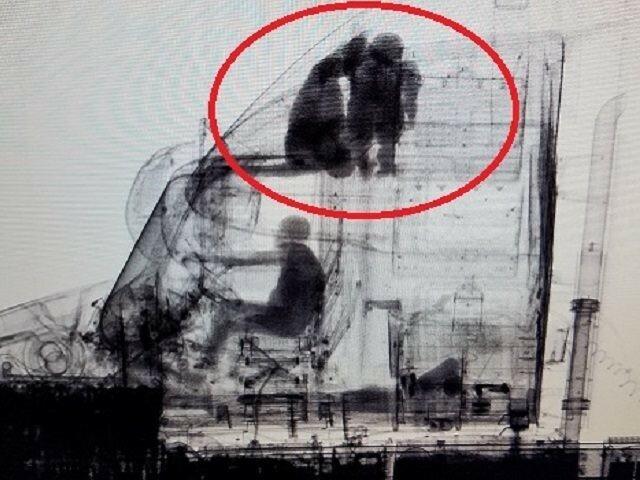 In October 2018, agents at the same checkpoint detected another human smuggling effort utilizing this same dangerous human smuggling tactic. In this case, the agent also found two migrants who were illegally in the U.S. hiding in the Windjammer, Breitbart News reported.